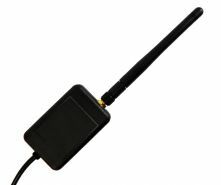 The wireless USB reciever allows you to access the data from your Aretas wireless monitor directly on your PC without the need for uploading to the web first. Access XBEE and ZigBee wireless networks on your computer using Windows or Linux. Using the USB wireless receiver along with Aretas’ Java software, it allows users to view real time data from your network of sensors. 1 min - 24hr viewable graph range.